Home » Physicians and Clinical Team » Jeffery J. Rowe, M.D. Dr. Jeffery Rowe completed a General Surgery residency at the Medical College of Pennsylvania/Hahnemann University. After two years, he began his Physical Medicine and Rehabilitation residency at the University of Pennsylvania. Following his residency, he had fellowship training in Interventional Spine and Pain Medicine. 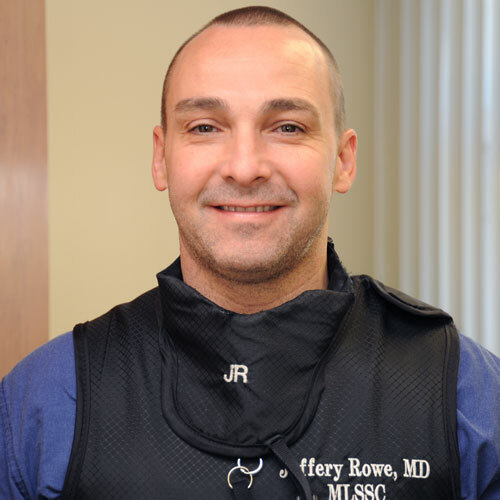 Dr. Rowe joined Main Line Spine in January 2005. He became board certified in Physical Medicine & Rehabilitation in 2004 and became board certified in Pain Medicine in 2005. Dr. Rowe has more than eight years of experience in Burn Surgery and Critical Care and more than eighteen years of surgical experience. His extensive surgical background and management of critically injured burn patients combined with his extensive experience and specialty training in the performance of diagnostic and therapeutic injections in the spine gives him a unique ability to both trial and surgically implant spinal cord stimulators and pain pumps. Dr. Rowe has gained national recognition for his many contributions to the study and treatment of pain and his dedication to furthering the field, particularly pain syndromes considered the most difficult to manage. Dr. Rowe is considered a key opinion leader in the pain management field, providing lectures and training throughout country to other physicians and medical practices. As a contracted consultant and instructor for Abbott (formerly St. Jude Medical), Nuvectra and Boston Scientific, Dr. Rowe teaches medical management and implant techniques for trial and for surgically implanted spinal cord and DRG (Dorsal Root Ganglion) stimulators. Dr. Rowe also engages in trials and surgically implants spinal cord stimulators for Medtronic. He is one of the educators and implanters for Vertiflex, a spinal spacer used to treat spinal stenosis. Dr. Rowe performs the Disc-FX procedure which is a minimally invasive discectomy treatment for a herniated disc. Dr. Rowe also performs the Intracept procedure for axial low back pain associated with degenerative changes in the spine.